How about robots as news anchors? DUBAI Using robots as news anchors will be a reality soon in Arab TV channels. 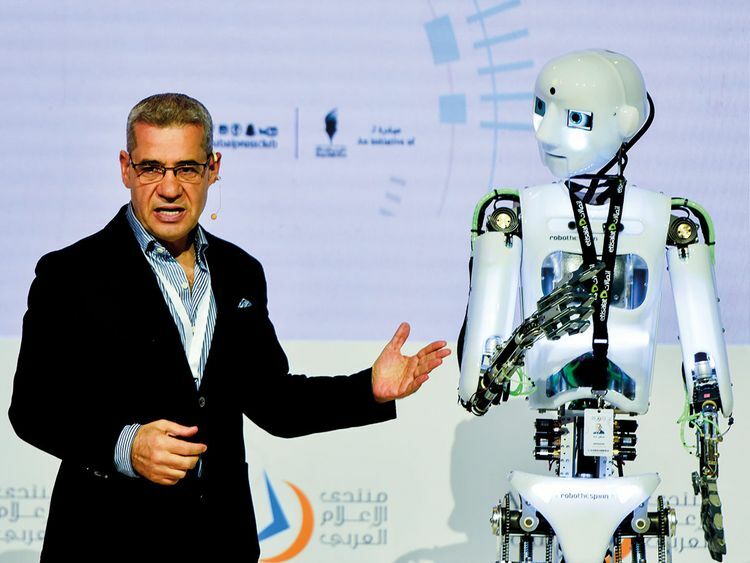 In a unique session held at the Arab Media Forum, a robot made a presentation to the audience about the future of news anchors in the Arab Media, even as Mustafa Agha, an anchor of a sport programme on MBC TV, was backstage controlling the robot titled ‘Aga A20-50’. “Robots are the future of media. We saw a Chinese robot become a TV presenter and welcomed robot Sofia. In the near future, robots will be used in the Arab world. Maybe MBC or Dubai TV will be the first to use them. Robots are smart and don’t need to wear a suit or go to the hair dresser,” Agha said. The session raised questions about the neutrality of robots in the future, but Aga said it would be up to the operator — a human. “Robots are controlled by humans now, but with the development of Artificial Intelligence, we might see a robot that is fully independent after 10 years. Robots can be neutral, but we [humans] need to supply them with correct and neutral news,” Agha added. Studies estimate that 1.5 million people will lose their jobs because of robots, but Aga thinks robots will in fact benefit humanity. “Recently a robot was assigned as a judge in Astonia. He is the first robotic judge in history and has given verdicts in financial cases worth 8,000 euros (Dh33,132). Robots can help humanity and won’t be a threat,” he added.